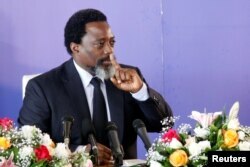 On UN Deaths, Haley Asks Congo's Kabila: What Happened to My List? FILE - United Nations U.S. Ambassador Nikki Haley listens during a U.N. Security Council meeting, Jan. 18, 2018, at U.N. headquarters. U.S. Ambassador to the United Nations Nikki Haley on Monday asked the Congolese foreign minister to deliver a message to President Joseph Kabila about the killing of two U.N. investigators: "Please ask Mr. Kabila what he did with my list." The list, which Haley told Kabila about when she met with him in Kinshasa in October, is of verified names of individuals involved in the murders of Zaida Catalan and Michael Sharp in March 2017, said the U.S. mission to the United Nations. Haley told Kabila "that justice for their murders was a priority for the United States," the U.S. mission said. Sharp, an American, and Catalan, a Swede, were killed in central Congo while carrying out independent investigations for a report to the U.N. Security Council. The bodies of Sharp and Catalan were found in a shallow grave two weeks later. Addressing Congolese Foreign Minister Foreign Minister Leonard She Okitundu during a U.N. meeting on Monday, Haley said: "I gave (Kabila) a list, and no action has been taken. That list is what we know needs to be looked at, and it is a serious list in reference to the deaths of those two people." Democratic Republic of Congo's President Joseph Kabila addresses a news conference at the State House in Kinshasa, Democratic Republic of Congo Jan. 26, 2018. A U.N. inquiry found in August that Sharp and Catalan were murdered by a group of Congolese, likely militia members from central Congo, but an absence of evidence "does not preclude the possibility that others are involved." Government spokesman Lambert Mende said in December that the authorities have not excluded the possibility that state agents were involved. A trial of a dozen suspected Kamuina Nsapu militia members started in June but was suspended in October pending the arrival in Congo of four U.N. experts in November to assist with additional investigations. The U.S. Mission to the United Nations said on Monday: "To date no serious action has been taken by President Kabila or the DRC government to investigate and arrest those involved with the murders of Michael and Zaida." Okitundu said investigations were ongoing and there must be a fair trial. He reacted angrily to a suggestion by Human Rights Watch during the U.N. meeting - on the Congolese electoral process - that the government was responsible. "You have to make sure you have proper serious evidence before you can accuse the government of murdering the U.N. experts," he said. "This is a serious accusation that can make your organization lose credibility."